The Klamath Falls Midge begins to appear in late June or early July in small numbers but swarms of them can be seen from mid July and they continue through most of September. This mouth-less insect does not bite but it is a constant nuisance for everyone who lives near the Upper Klamath Lake and the A Canal. 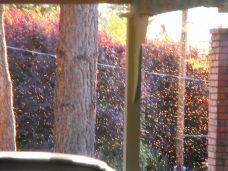 The first swarm of midges appeared in our neighborhood on June 29th. Every day they seem to increase in numbers. The spider webs have been built and are awaiting their prey. Their number are large enough that I have even been able to 'sing' to them (more details below). Swarms of midges can be seen at anytime of the day. A drive near Upper Klamath Lake can quickly coat the front of your vehicle with thousands of dead midges. Because of this the residents try to avoid driving near the lake anytime close to dusk, at night, or early in the morning unless it is absolutely necessary. Little is known about the origin of the Klamath Falls Midge. The earliest settlers to the region have written about seeing swarms of insects near Upper Klamath Lake. The only other location where the midge exists is at Lake Victoria in Africa. More than a dozen species of midges live in Klamath County but the two most prominent are the green and black varieties. The lifespan of the midge is reported to be 24 hours but my experience tends to point to at least 48 hours or longer. The midge's purpose in life is to mate and reproduce. Once they have mated and laid their eggs you can expect another batch of midges in about two weeks. My wife and I are fascinated by the Klamath Falls Midge. Well, at least I am fascinated by them and my wife hates them. We have learned to turn all lights off near a window after dark and we never leave a window open with a light on unless we want to wake up in the morning with a handful of dead midges near the light. And the spiders love to build their webs under the eaves of the house and it's a constant battle to clear the cobwebs. Every morning I have to sweep up the dead midges in front of our garage. 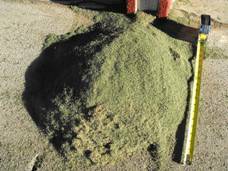 This pile of midges are over 18 inches in length and 12 inches wide. It is not uncommon to have a large pile of midges. These piles are where I collect my samples. I have a sample of midges from 1999, 2004, and 2010. I keep them in glass jars just in case someone wants to see what they look like. Here's one fact that you will never hear anywhere else about the Klamath Falls Midge - they are sensitive to sound. In fact, they are very sensitive to the C note on the music scale. It can be in any octave. When they hear it they go crazy! When they are swarming I like to walk around the yard and 'sing' to them. When I sing the C note they stop swarming in unison and scatter in all different directions. When I stop singing they return to their swarms. You might try singing to them sometime but make sure no one is watching or they might think you're crazy! Return to the Home Page from the Klamath Falls Midge Page.